His Divine Grace Shrila Bhakti Pramode Puri Goswami Maharaj appeared on this earth at Ganganandapur village, Jessore district, presently named Bangaladesh on the 18th of October, 1898 . Since his appearance he exhibited spontaneous attraction for The Supreme Personality of Godhead Lord Shri Krishna. His father name was Tarini Charan Chakraborty and mother name was Ramrangini Devi. He appeared in a strict Brahmin family and started to follow the path of devotion as a young child by the influence of his neighbor Bhakti Ratna Thakur, theGodbrother of Shrila Sacchidananda Bhakti Vinode Thakur. As per the instruction of Shrila Bhakti Ratna Thakur he worshiped Shri Shri Radha Madan Mohan and was encouraged to take shelter the founder president of all Gaudiya Maths and branches around the world, His Divine Grace, Shrila Bhakti Siddhanta Saraswati Goswami Thakur Prabhupada. In 1915, the day after Shrila Gour-Kisore Das Babaji Maharaj's disappearance day, he went to Mayapur and met with Shrila Prabhupada. At that time Shrila Prabhupada was wearing white cloth and following strict Brahmachari life. Pramode Bhusan Chakrabory ( Shrila Bhakti Pramode Puri Goswami Maharaj) felt attraction to see the strict and sober nature of Shrila Prabhupada. At that time his (Shrila Prabhupada) name was Bimala Prasad Datta.After Pramode Bhusan attended the Samadhi ceremony of His Divine Grace Shrila Gaura Kishor Das Babaji Maharaja he had chance to meet with Bimala Prasad..After this meeting Pramode Bhusan decided to take shelter of Bimala Prasad as his eternal Spiritual Master.Pramode Bhusan met with Bimala Prasad again in 1917, at Yogopith temple when he accepted Mahaprabhu's prasadam from the hand of Shrimati Bhagavati Devi,mother of Bimala Prasad. Once pujari, Pramode Bhusan forgot to offer a blanket in the winter time to Shri Shri Radha Madan Mohan. That night Pramode Bhusan awoke with chills through out his body and soon realized the cause of the chills were due to his forgetfulness in the service of their Lordships Shri Shri Radha Madan Mohan. He immediately went to the house of Bhakti Ratna Thakur and explained the situation.As per the direction of Bhakti Ratna Thakur, Pramode Bhusand immediately took a cold bath in the pond nearby.After that he entered the temple for offering the blanket to Shri Shri Radha Madan Mohan. As soon as he offered the blanket the chills in his body left immediately. So, since his early teenage childhood period Shri Shri Radha Krishna, our Divine couple were receiving service by Pramode Bhusan in various ways. Shrila Prabhupada in 1918 on Gaura Purnima day after accepting the order of Sanyasa came to Kolkata to spread the message of Shri Chaitanya Mahaprabhu and Radha Krishna.He would give Shrimad Bhagawatam class every day at Bhaktivinode asan. Many intellectual persons came to attend his class.In 1920 Pramode Bhusan ,after finishing his degree with honors in chemistry took an office job in Kolkata,As soon as Pramode Bhusan heard the news that Shrila Prabhupada was giving class daily he also began attending daily.Once a scorpion bit Pramode Bhusan, just before he started to attend the class of Shrila Prabhupada. Although you can imagine the pain felt by the bite of the scorpion still Pramode Bhusan went to the class without consideration. 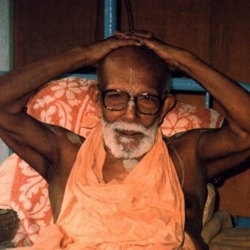 Due to Shrila Prabhupada's transcendental vision he could understand the sound faith of Pramode Bhusan for attending his class, even though he was suffering from the bite of a scorpion . On that day, Shrila Prabhupada called Pramode Bhusan after His class and invited him to stay in his Math. As per the order of Shrila Prabhupada, Pramode Bhusan started to stay in the Math just few months after that order on the day of Ramchandra's Lanka -Vijaya festival. Shrila Prabhupada also allowed Pramode Bhusan to continue working at the office while staying in the Math for supporting his family. In this way, Pramode Bhusan continued like this from 1921 to 1923 and simultaneously gave financial support to his family at Ganganandapur, Bangladesh. On the auspicious day of Shri Krishna Janmastami in 1923, Shrila Prabhupada approached Pramode Bhusan and said, today I would like to give you initiation and also from today you have to quit your office job and fully engage your time to my publication department. Pramode Bhusan hearing the order of Shrila Prabhupada became overwhelmed with joy and without reservation accepted first and second initiation along saffron dress all at the same time.He was given the name Pranabananda Das Bramhachari .After initiation Shrila Prabhupada gave a fountain pen to Pranabananda Das Bramhachari and told him to use this pen for your service from today forward. From that day Shrila Prabhupada kept Pranabananda Das Bramhachari near him at all times to dictate new articles for the purpose of publication.Due to this most important service of Pranabananda Das Bramachari we are able to read Shrila Prabhupada's articles and books. Nowadays these books are still available in Gaudiya Math at Bag-Bazar, Kolkata and Shri Chaitanya Math at Mayapur. Due to his humility, he never allowed his name to be printed inside any of these books. In 1926, he was put in charge of running Bengal's only daily Vaisnava newsletter, named Dainik Nadiya Prakash. He continued this service for three years, publishing all of his preceptor's daily discourses along with articles by fellow students and other contemporaries.At this time all books, magazines, and newsletters were all done manually. To see the sincerity and hard work of Pranabananda, Shrila Prabhupada awarded him the title Maha-Mahopadesaka and Pratna-Vidyalankar. Due to Pranabananda Das Bramachari's close relationship with Shrila Prabhupada and out of Shrila Prabhupadas affection he would sometimes make jokes with Pranabananda.Many times during prasadam Shrila Prabhupada with smiling face and eyes wide open he would say, Pranab belongs to Jessore and people of Jessore like to eat molasses so give him lots of molasses and make him happy. Also sometimes Pranabananda's mother would send distressful letters about family matters at home.Shrila Prabhupada would come to the prasadam hall and explain the contents of the letters to all the devotees, in the presence of Pranabananda .Shrila Prabhupada would say with smiling face Pranab's mother is writing such a distressful letter that after reading this even I'm feeling so much distress,so what will happen when Pranab reads the contents of this letter? In 1936, when Shrila Prabhupada was at the inauguration ceremony in Bhubaneswar Tridandi Gaudiya Math,, Pranavananda was offered by Shrila Prabhupada to accept Sanyassa initiation. Pranabananda due to his extreme humility thought himself unfit for taking the vow of Sanyassa and humbly declined the offer of Shrila Prabhupada. In December of 1936 at Bagh Bazaar Gaudiya Math in Kolkata Shrila Prabhupada due to the condition of his heart was being looked after by several intimate disciples.One morning while Pranabananda was serving Shrila Prabhupada in his room Shrila Prabhupada placed his lotus feet on the chest of his dear Pranab.With tears in his eyes Pranabananda, holding the lotus feet of Shrila Prabhupada to his chest, saidwe are all so young so what will happen to your mission if you leave us now.We need you here to guide us.Shrila Prabhupada softly repliedPranab,Krishna Krishna Krishna. In 1942, Shrila Prabhupada appeared to Pranabananda in a dream and imparted to him the sannyas mantra, ordering him to accept the renounced order. Five years after this transcendental dream in 1947, he took the vow of Sanyassa from His Godbrother, Shrila Bhakti Gourav Baikhanas Maharaj at Gour-Gadadhara temple,in Champahati with the help of Sat-Prasanga-Nanda Das Brahmachari who after taking Babaji initiation(from Shrila Bhakti Pramode Puri Goswami Maharaj) was known as Nayananandadas Babaji Maharaj. 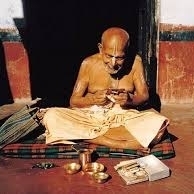 After the disappearance of Shrila Prabhupada, Pranavananda Das Brahmachari continued his service of spreading the teachings of Shri Chaitanya Mahaprabhu through the Gaudiya Magazine, first out of the Bagh Bazar Gaudiya Math, then at Yogapith temple the birth palce of Shri Chaitanya Mahaprabhu at Mayapur .Also he was engaged as temple president of Yogopith temple for almost seven years, as per the order of his senior Godbrother, Kunja-Babu. After continuing seven years of service to Yogapith temple he relocated to Kalna, a Holy place where Gouridas Pandit and Suryadas Pandit, intimate associates of Shri Chaitanya Mahaprabhu manifested their pastimes with Hriday-Chaitanya Prabhu at bank of the Ganga river. Shrila Bhakti Pramode Puri Goswami Maharaj remembering all these pastimes stayed their on the bank of the river Ganga at Kalna in a small kutir worshiping his home Deity for the next three years. After that the King of Burdwan was extremely impressed by his saintly character and in 1958 the king offered Shrila Bhakti Pramode Puri Goswami Maharaj a three hundred year old Temple of Shri Ananta Vasudeva at Kalna. In the same year,on the appearance day of Shrimati Radha Rani, Shrila Bhakti Pramode Puri Goswami Maharaj entered the temple to stay and serve the deities.After three years passed Shrila Bhakti Pramode Puri Goswami Maharaj felt separation from the service of publishing the message of Shri Chaitanya Mahaprabhu given by Shrila Prabhupada.After a short time, Shrila Bhakti Dayita Madhava Goswami Maharaj approached Shrila Bhakti Pramode Puri Goswami Maharaj to take the service of the Chaitanya Vani Magazine editorial department as well as taking care of his publication department for the service of Shrila Gurudeva and Mahaprabhu..Finally Shrila Bhakti Pramode Puri Goswami Maharaj left the temple of Shri Anatna Vasudeva and gave the responsibilities for taking care of the temple to one of his intimate associates named Nani Gopal Prabhu.In this way from 1961 to 1989 he undertook these various services in the department of Shrila Bhakti Dayita Madhava Goswami Maharaj and also traveled to different temples of his Godbrothers for helping their publication department as well. Once a Godbrother of Shrila Bhakti Pramode Puri Goswami Maharaj, Pujjyapad Shri Madan Mohan Das adhikari took all of his family members to accept initiation from Shrila Bhakti Pramode Puri Goswami Maharaja.Starting in 1981 Shrila Bhakti Pramode Puri Goswami Maharaja began accepting all the family members and gradually gave them initiation one by one.One of those family members was the grandson of Madan Mohan Dasadhikari Shrila Bhakti Bibudha Bodhayana Maharaja,now the present Acharya and successor of His Divine Grace Shrila Bhakti Pramode Puri Goswami Maharaj. It is a well known fact that Shrila Bhakti Pramode Puri Goswami Maharaj was the foremost expert in regaurds to Diety installation,Samadhi ceremony,and Temple foundation installation.Shrila Bhakti Pramode Puri Goswami Maharaj upon the request from his dear God brothers actually installed almost all of the deities within the Gaudiya Math and also performed the Samadhi ceremony of most of his God brothers including His Divine Grace Shrila Bhakti Rakshaka Shridhar Dev Goswami Maharaj,and His Divine Grace Shrila Bhakti Dayita Madhava Goswami Maharaj.It should be noted that His Divine Grace A.C.Bhaktivedanta Swami Prabhupada also requested His Divine Grace Shrila Bhakti Pramode Puri Goswami Maharaj to lay the corner stone foundation at Shri Mayapur Chandradaya Mandir.In this way we can see the magnanimous mood of Shrila Bhakti Pramode Puri Goswami Maharaj to engage in these services to all his God brothers without any reservation. 1n 1987, at the age of 89, Shrila Bhakti Pramode Puri Goswami Maharaj at the request of the family members of Pujjyapada Shri Madan Mohan Dasadhikari accepted a small piece of land in Ishodyan, Sree-Mayapur Dham . Amongst the family members Shripad Gopinath Das Brahmachari, Vimal Krishna Dasadhikari, Madhusudan Dasadhikari were so much eager to make one bhajan Kuthir for their Gurudeva, His Divine Grace Shrila Bhakti Pramode Puri Goswami Maharaj.After making one small bhajan kutir gradually lots of devotees started approaching Shrila Puri Bhakti Pramode Puri Goswami Maharaj for his shelter,siksha,and blessings.Finally he decide to install his ultimate Prayojana-Tattva deities, Shri Shri Gour-Gadhara, Shri Shri Radha-Gopinatha and Shri Jagannath Dev.. A few years later, Shrila Bhakti Pramode Puri Goswami Maharaj ordered his disciple Shripad Ramdas Prabhu just after the time of initiation to bring a Lakshmi Nrisimha Deva Deity to His Mayapur temple.In the following years, he established other temples in Jagannath Puri Dham, Vrindavan Dham, Kolkata and Midnapore. Shrila Bhakti Promode Puri Maharaja had outstanding love for his godbrothers and was inspired in his glorification to other Vaishnavas. He found richness in everyone he met. He had the quality of making one feel so much wanted and their life so much valued. At the same time, he paid the least attention to himself. He was an emblem of humility and simplicity, and his generosity of spirit and kindness touched the hearts of the whole Vaishnava community.Shrila Bhakti Pramode Puri Goswami Maharaja set the example throughout his life how one can manifest the actual mood of how to be more humble than a blade of grass, more tolerant than a tree,and to be always ready to offer all respects to others irregardless of their backround.We are greatly indebted to His Divine Grace Shrila Bhakti Pramode Puri Goswami Maharaj for his lifetime of pure devotion, spanning over a century, which we can aspire for, learn from, and discuss about for our own spiritual nourishment. His Divine Grace Shrila Bhakti Pramode Puri Goswami Maharaja departed this world for the eternal abode in the predawn hours of Narayana Chaturdasi, October 21, 1999, one day before Rasa Purnima. His divine body was transported from Jagannatha Puri to the Gopinatha Gaudiya Matha in Ishodyan Shri Dham Mayapur and there he was placed in his eternal samadhi Mandir. Prior to his departure from this world, Shrila Bhakti Pramode Puri Goswami Maharaja appointed his intimate disciple, Shripada Bhakti Bibudha Bodhayan Maharaja as his successor to Shri Gopinatha Gaudiya Matha for the purpose of carrying on his instruction to spread the message of Shri Chaitanya Mahaprabhu around the world. In years to come as more of his words and visions are translated, the world outside of Bengal and India will come to know the spirit of the true Vaishnava religion that he tirelessly made available through his editing and publishing service. May the gentle rain of nectar of his perfect teachings continue to bring auspiciousness into this world.